Laurenz Laufenberg as Hofmiller. Photo: Jamie Williams. This was more like a dream than a play. But then director Simon McBurney has a way of doing that: of disorienting you – in this case of reminding you that what you are watching is not real, and simultaneously making it so completely immersive as to keep the brain’s imagination synapses firing. 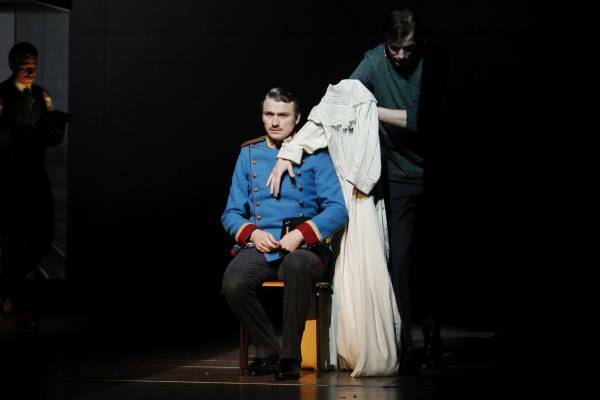 Of course the raw material for this co-production between Schaubuhne Berlin and McBurney’s Complicite is also unsettling and strangely oneiric, about a young Austrian cavalry officer, Hofmiller, meeting Edith, a paraplegic girl who falls in love with him, while his own emotional involvement extends no further than pity. A novel’s tone is the trickiest component to retain in a stage or screen adaptation, and with Stefan Zweig’s 1939 novel being a story within a story, its first-person perspective is crucial, because Hofmiller is as bad a judge of character as he is naive, so we, the audience, must have the means to see through elements of his telling of his own story. McBurney’s ingenuity has seen off that obstacle. 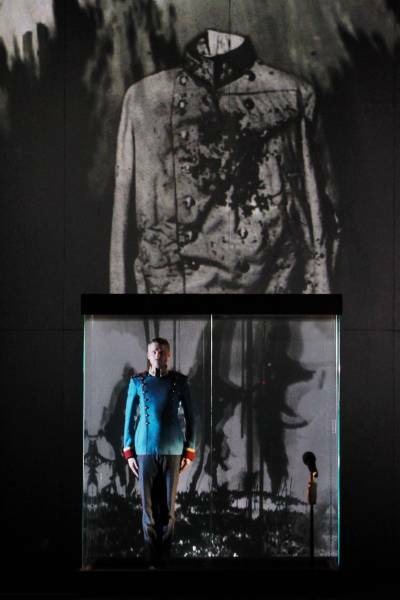 He has two eerily similar actors playing Hofmiller: Christoph Gawenda as the narrator version, and Laurenz Laufenberg enacting events as they unfold. 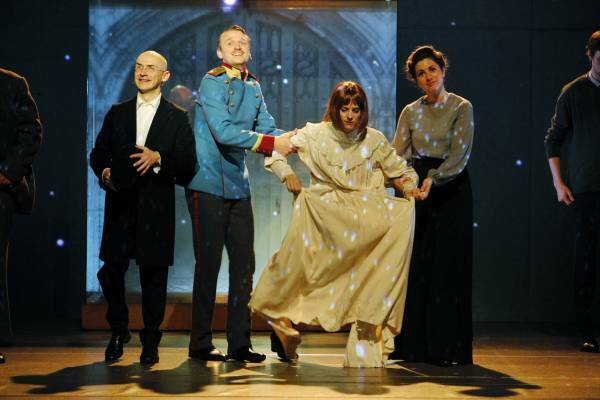 It is a brilliant solution, as is having the seven actors arrive on stage out of character, and, as Hofmiller tells his story, they are gradually drawn into it; gradually assume roles and costumes; gradually bring the narrated tale to dream-life. 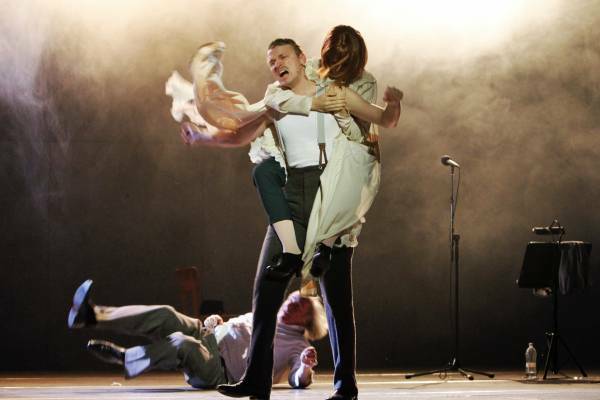 The acting is thrilling in its intensity and truth, and mesmerising in its realisation of McBurney’s trademark visual story-telling, which incorporates mime and illusion, despite being such a heavily text-based piece. Just as the words are made to float on the physical acting, so the music and sound (Pete Malkin), video (Will Duke), set (Anna Fleischle) and costumes (Holly Waddington) all submerge themselves beneath the dream-play surface. Extraordinary coups still occur, but never merely to amaze us. Edith’s dress as a “puppet”. Photo: Jamie Williams. Both Hofmillers excel, and Marie Burchard is an explosively volatile Edith, an effect compounded by Eva Meckbach (who also plays Ilona) sometimes doubling Edith’s lines, or delivering them through a microphone while Burchard mimes. Just as good are Johannes Flaschberger (as the deceptively noble Dr Condor), Robert Beyer (in catching Edith’s father’s piteous love) and Moritz Gottwald (who realises and an impressive array of minor characters). The use of microphones is pivotal to the production’s success, sometimes creating layers of voices like a musical score. Even more compelling are images that burn themselves into the brain: the pose Hofmiller sustains having asked Edith to dance (not knowing she cannot); the use of Edith’s white dress as a heart-rending puppet; a glass box becoming a train; Beyer playing Condor’s blind wife; the set’s ceiling closing in as if to crush the militarism, classism and nationalism that sow the seeds of two world wars. “It’s good to know there’s one thing you’ve done well,” Condor tells Hofmiller. McBurney and Schaubuhne Berlin can rest easy on that score. If Beware of Pity never lands a knock-out emotional blow, that is part of the detachment intrinsic to Hofmiller’s perspective in telling the story. Or did I just share his dream?